..and apparently Cruise and Bruckheimer involved. No word on Goose yet. Fried Gold wrote: Val Kilmer confirmed. That was a confusing post... Francis Ford Coppola directing???? Wow...he responded to just about every post there. He claims to be down to 165 pounds???? and starring "retired from acting" gene hackman? it's hard to imagine THIS is the film that would lure him back. ok, after reading the "revised" post, apparently the FFC and hackman quotes were just examples of things an actor would automatically say yes to. they're not actually involved in whatever this is. They should really get Harrison Ford in this. Justin Kroll wrote: Tom Cruise is getting ready to head back to the Danger Zone — and he’s bringing an old friend along for the ride. Sources tell Variety that Joseph Kosinski — who directed Cruise in “Oblivion” — is the front-runner to direct “Top Gun 2” for Paramount and Skydance Pictures. While no official offer has been made, several insiders believe one is imminent. Cruise met with potential helmers prior to and while filming “Mission Impossible: 6” in London to ensure the “Top Gun” sequel was ready to go after production wrapped. Even with Cruise and Kosinski having previously worked together on the 2013 sci-fi action film, sources say it was Kosinski’s vision the sequel’s direction that officially won him the job. “Oblivion” was a huge hit for Cruise and Kosinski bringing in $286 million worldwide and only seemed like a matter of time before the two worked again. Cruise recently confirmed to a British talk show that the sequel was moving forward and would hopefully shoot at the start of next year. The thought of making a follow-up to the 1986 pic that made him a bonafide star has been on Cruise’s agenda for some time. The project has gained momentum in recent years, especially after “Jungle Book” scribe Justin Marks was tapped to pen latest draft. Skydance CEO David Ellison and Jerry Bruckheimer, who produced the original, will produce with Cruise. This latest project will be set in a world of drone technology and fifth generation fighters and explore the end of an era of dogfighting which made the original film so exhilarating. Other plot details are vague but Val Kilmer has gone on record that he was asked to come back to reprise the role of Iceman opposite Cruise’s Maverick. While Cruise has worked with a wide range of directors over the years, he’s never afraid of reteaming with past helmers if previous relationships work out. After a successful shoot on Universal’s sci-fi pic “Oblivion,” Cruise was close to joining Kosinski on his racing pic “Go Like Hell” at Fox as iconic car designer Carroll Shelby. The film ultimately fell a part but Cruise made it clear of fond he was of working with Kosinski and was open to future ventures. Kosinski’s recently wrapped the firefighter action pic “Granite Mountain” starring Miles Teller and Josh Brolin with Sony releasing this fall. Cruise can be seen next in “The Mummy” which bows on June 9. The 'Top Gun' sequel 'Maverick' will open July 12, 2019. Mike Fleming Jr wrote: EXCLUSIVE: Paramount Pictures has set July 12, 2019, as the release date for Top Gun 2, the long-gestating sequel to the 1986 hit. Tron Legacy director Joseph Kosinski has been set to helm the film, re-teaming him with Tom Cruise, whom he directed in the sci-fi pic Oblivion. 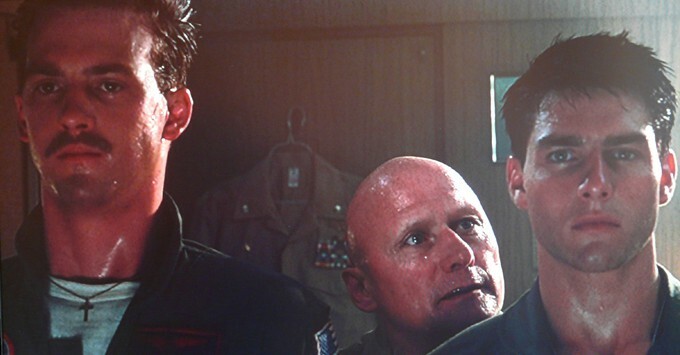 Cruise reprises his role as Maverick, now a flight instructor teaching the young macho pilots how to do it. Jerry Bruckheimer is reprising as producer. The script is by Peter Craig and Justin Marks, along with Ashley Miller and Zack Stentz. The film has long been in development and got close several years ago with the original director Tony Scott planning to step behind the camera again. His untimely death shelved the film for years. It comes at a good time for Paramount, which is reloading its franchises under new chief Jim Gianopulos. This certainly gives the studio a branded title with a lot of wanna see attached to it.